Compared to the past several years, spring was a bit tardy coming around. However, on the trails of the northern Missouri Ozarks, she showed in full splendor this weekend. I started off yesterday morning wanting to visit a few places in the Steelville/Salem area and first stopped at Red-Bluff recreation Area along the Huzzah Creek. I hiked the trail and listened to the Parula, Yellow-throated Warblers and Black and White Warblers as they advertized their newly forming territories. I checked out the bluff and looked in vain for the Davidson Natural Bridge nearby. If anyone has any information to pass on concerning how to find this feature, I’d appreciate it. From there I headed to Zahorsky Woods, an approximately 50 acre, high-quality wooded lot owned by TNC. I was having some trouble finding the trailhead I was looking for when a friendly man named Bob stopped and helped me out. He explained he was one of the owners of the neighboring Wildwood Spring Lodge, and invited me to park on his property and use the trailheads not only to Zahorsky Woods, but to the trail network that runs on his property. He gave me a quick description and directions to some interesting features, including Steelville Natural Bridge that sets nearby the Meramec River. Thanks Bob! The views from the bluffs on both of these properties were very nice and the flood plain within Zohorsky was full of ephemeral wildflowers and other interesting things to see. My next stop was Sutton Bluff, which rests along the Black River. Very birdy and a nice hike. The view from the top leaved a bit to be desired due to the fact that the very nice campgrounds filled most of the valley! It should be quite a site from below during autumn, however. Photos from these location will follow in the near future. 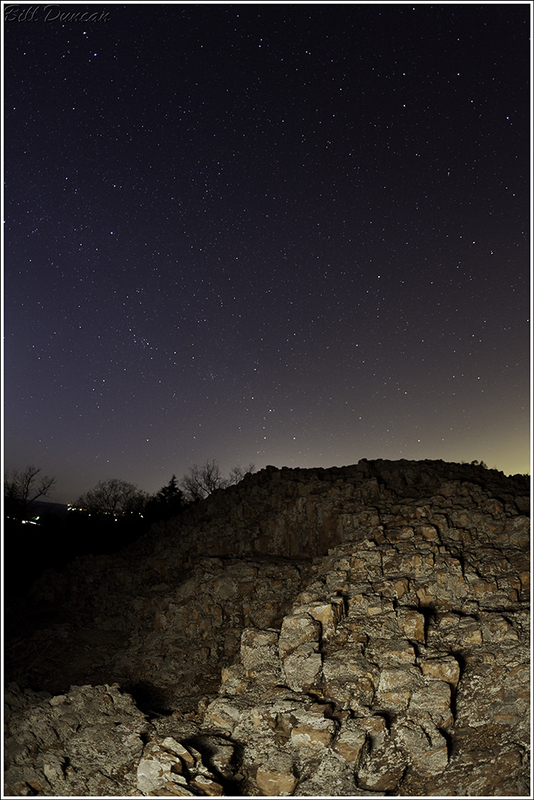 My final stop was to Hughes Mountain near Ironton for a sunset and attempts at some “nightscapes”. Steve joined me after his long shift at the hospital and kept me company on top of this windy Ozark peak. The image below is probably my best from what I attempted last night. Not terrible for my first serious attempt, but far from perfect. Being reared and still residing in the big city, every time I can see a night’s sky like this is extremely special for me. I can’t imagine what it would be like to see this on any clear night. I can’t wait to try this some more! Please enjoy your spring. Like childhood, they do not last long enough. nce shot, too bad you got such a strong light on those rocks. Makes me want to try some long exposures! I hear you, Steve. I added most of your species on our trip to Big Spring and surrounding areas the past few days. I still have not had any Tanagers! I can also add Golden-winged Warbler and Black-throated Green Warbler. I have not had either Grosebeak species either. I can’t wait for the Wood Thrush. It is not yet the season without one. Previous Previous post: You Do What Five Days A Week?